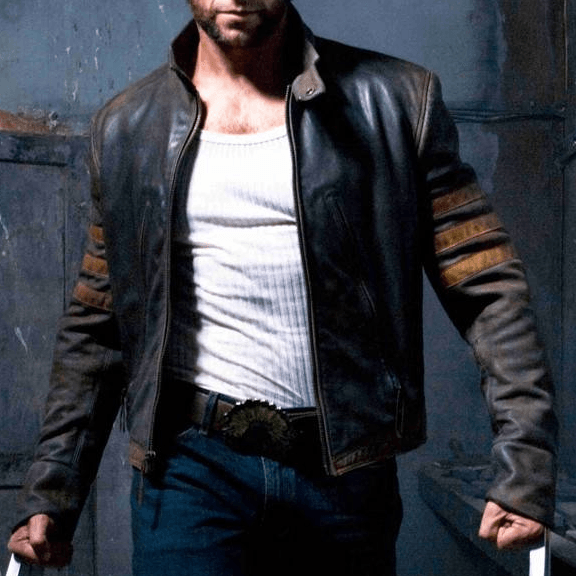 Vanson made this jacket to be worn by Hugh Jackman as Logan/Wolverine in the original X-Men film. Just going by box-office numbers probably some 30 or 40 million people will have seen it, just on the big screen. This jacket is the real deal. It's made exactly the way we made it for the movie studio. It's not a derivative, it doesn't claim to have some of the same DNA... it's not a cousin, it's a sibling. Of course in the movie it looked a little weathered, a touch distressed - but it's something you'll have to do for yourself, if that's the look you want. Since this may involve jumping down wells as nuclear bombs go off, not just being pawed and clawed by young Japanese women, we'll leave it up to you to decide. In any case this is how we delivered it to the studio. The Wolverine is even stripped of cultural references a clean, very stylish fitted jacket. If we weren't as honest as we'd like to think we are, we'd say its slanted pockets and flattering lines instantly make you look taller, slimmer, more elegant... yet it's still a proper motorcycle jacket, something you can wear for protection on the bike. Size 42 - Chest measures 48.5 inches = Normal ease is 6.5 inches. These jackets are classic American fit and style:. Meant to fall between beltline and hips. Bottom circumference sweep is 44 inches.